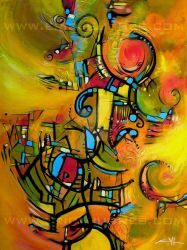 Whenever I feel inspired, I hurry to my studio to follow my “unusual” approach to modern art because I have synesthesia. My creative process remains paramount; I use mainly acrylics, collage and mixed media to create imageries where pictorial organization and movement translate symbiotically with colour into a rhythmic and structural wave. I explore and express my impulses in an evolutionary and instinctive fashion, using lines, shapes and colours, and I do not hesitate to add textured elements and collages to acrylics, my preferred medium. Thus, my creative process remains paramount in an approach that attributes greater importance to the organic nature of the materials and to the embodiment of the execution than to the intellectualization of a process. 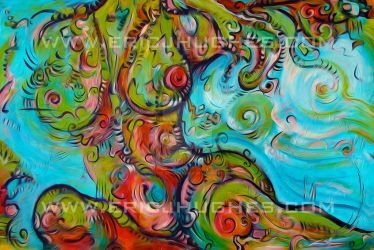 Often inspired by music when I paint, I sometimes allow myself to become captivated by my senses, acting then as a catalyst. Thus, my visual experimentations are created instinctively, which allows me to renew my creativity through each of my paintings. My works are born more of an urgent need to create than of the application of an accepted technique. Distinct series organize themselves naturally; nothing is truly planned, because the secret order that can be identified in my work does not appear until after the fact. In other words, like the two precepts of life that support the constant evolution of all things and the spirit’s infinite possibilities, I do not limit my work to any specific procedure so that I may rediscover myself with each creation.